How does a small organization looking to control spending decide between common productivity tools, such as Microsoft Outlook or Excel, or a more robust solution(CM)? This decision is made more difficult by the emergence of customer relationship management (CRM) and contact management (CM) solutions. Both CRM and CM tools are productivity tools that allow businesses to organize contact, opportunity, and account information in a centralized repository. The documented business benefits of both CRM and CM tools have some small and medium-sized businesses evaluating these solutions to alleviate their specific business challenges. 1. Personal Information Management (PIM) = Software that provide basic information management functionality, such as calendar, address book, and light contact management. Microsoft Outlook and Lotus Notes are examples. Companies leveraging a PIM solutions as the primary form of contact management can often suffer from "information overload." Unorganized in boxes, for instance, can make it hard for employees to find the messages/notes they need quickly and easily. 2. "Freemium" Contact Management (FCM) = Contact management solutions that provide basic CM functionality on a trial, controlled usage, or ad supported basis. Free CRM and Zoho are examples. The "try before you buy" allows businesses to experience the benefits of a CM solution and evaluate the features necessary for daily operations. However, businesses must establish who owns the data and develop a contingency plan in the event the FCM does not scale appropriately. 3. Contact management (CM) Solution = A productivity tools designed to manage contacts, opportunities, accounts, and interaction. ACT! as an example. A CM solution is crucial for companies with multiple sales representative, accounts, and opportunities. CM solutions allow businesses to organize sales outreach, while a CRM solution may be a better fit for companies looking to unify sales, marketing, and customer service and support efforts. 4. Customer Relationship Management (CRM) solution = CRM is a strategy used to learn more about prospects and customers' needs and behaviors in order to develop stronger relationships with them. A CRM solution provides the ability of an entire organization to effectively identify, acquire, foster and retain loyal customers. 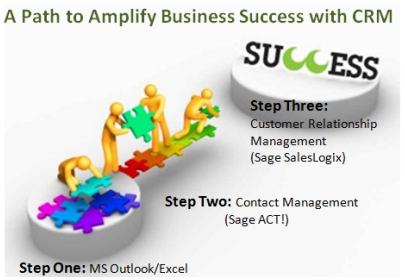 Infor CRM (formally Saleslogix) as an example. For small businesses without a defined CM, the use of email and spreadsheets typically serve as the primary form of contact management. Of the 260 total respondents to a 2008 Aberdeen survey, more (77%) indicated the use of Microsoft Outlook for contact management that a sales force automation (SFA) tool (30%). The advent of free solutions has provided theses companies with another alternative; however, the streamlined features that small-to-medium businesses require are often included with a "Premium" solution. Forty-seven percent (47%) respondents indicated that integrating sales and marketing processes is a top two strategy for supporting sales force automation initiative. The use of an integrated CM solution allows businesses to manage account and contact information and history, as well as send targeted email messages to specific customer segments. The reliance on spreadsheets and email system for account management does not allow for such a unified sales and marketing outreach. Weigh your current business needs against future growth. "Freemium" solutions are an enticing option for small or new businesses. However, companies must evaluate the ability of the solution to grow with the business. Free solutions may indeed be the most cost-effective option in the short term. However, as a company grows and takes a larger number of customers and contacts, the complexity of operations and amount of fragmented customer data are likely to increase. Companies must be sure that whichever solution they implement has the ability to address the short-term goals of the company, as well the plans for growth. How about your next actions? CRM Effectiveness . . . If you'd like to start a conversation about what is possible, a need to make a switch or upgrading your experience in getting more from your CRM, visit our home page or give us a call: 269-445-3001.